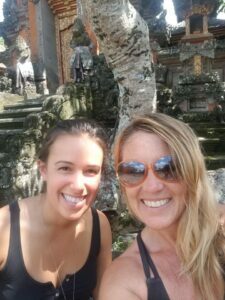 This is the Story of 2 Women, Bali, Indonesia, Intuition and Crazy Synchronicity. Oh yea…and Me. In 2009, after working for 4 years as a Travel RN Recruiter in San Diego, I put all my energy and intention into manifesting my job layoff.. and it worked. This inspired two things: the “invention” of my first Strangers To Friends card… and… the questioning of “My Purpose”. Turned out, a RN Recruiting Co Worker had a son who was best friends with a boy who had a Mom, who was the Founder of Careers With Wings, so she connected us. Cue in Marcy. In 2010, Marcy became the first ‘Coach” I ever worked with, before everyone had a coach, but divinely on time. You see, this was the point in my life I began to recognize I had a gift of connection which opened myself to explore more passion in “what do I want to do”. Though I’d go onto accept another RN recruiting job a year later. I also, like the previous one, realized it no longer served and believe it or not, once again, manifested my layoff. With another “window of opportunity” to pursue my “purpose” of turning strangers into friends, I decided to leave San Diego and take on a 6 week, 15 city, cross country road trip and move to Wilmington, NC. 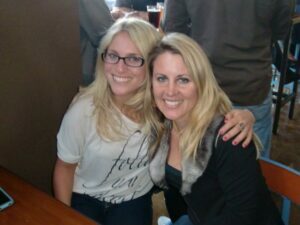 This photo of Me & Marcy was snapped at my “Going Away” Party days before I hit the road! Fast forward 8 years: though we don’t regularly keep in touch, we’ve literally been each others “cheerleaders” from afar. If nothing else, never missing a “Happy Birthday”. That’s how I knew, via Facebook, Marcy chose to celebrate her 50th this year in Bali, Indonesia! 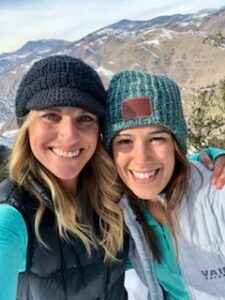 January 2018, promoting an upcoming STF Experience, I sent a newsletter to the Strangers To Friends Meetup, announcing giveaways at the event from one of my favorite Colorado Local Businesses (another Strangers To Friends Story), Be Hippy. (PS: Enter code “Friends” to receive 10% off) The next day, I got a Meetup Message from a gal in Fort Collins asking to be connected with the owner of the company to inquire about sponsorship for her retreat! So, I connected them… and you guessed it, they agreed to partner! But it wasn’t this success that sparked my excitement. As Sarah and I moved from Meetup to Facebook, I asked questions! Turns out she’d recently relocated to Colorado via Boston (where I was born) and I was already friends with the gal speaking at her retreat! Small World! Clearly, we were meant to meet. 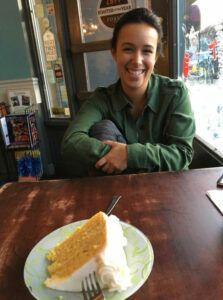 This photo of Sarah was taken on Jan 16, 2018, the we sat for hours story swapping and salvaging over our synchronicity– and this slice of lemon cake ! (Side Note: the man behind us overheard our conversation… and us eyeing his piece of cake… and surprised us with a huge slice to share!) But, the real story: this coffee date was the beginning of a beautiful friendship. For the last year, she and I have coached each other, collaborated with each other and even helped each other move. Moments she “needs” someone, I’m her go to. The moment I need a “pick me up”, she seems to know. That’s why I was so excited she was off to Bali, Indonesia for the month of November for the trip of a lifetime. The next photo was taken Jan 20, 2019 unaware it was our 1 Year Friendaversary! Wait, what is she talking about??? Who do I know in Bali? After traveling for 2 weeks in Asia with her job as the Alumni Events Director for Semester At Sea, Sarah was on the last leg of trip, now waiting in the Bali Airport to get picked up to head to her Uncle’s Home in Ubud. Feeling all the feels from a day of travel, she craved connection with someone friendly, perhaps an American Woman, someone with whom she could relate. Have you ever thought to “randomly” talk so someone across the room? Though I know Sarah as a leader, I also know, she isn’t the gal who typically jumps up to head across the room and strike up “stranger” conversations. That is, until the “What Would Carlyn Do?” thoughts popped into her mind! As she shared with me, she glanced around the airport and spotted a blonde woman by herself, who she did a double take on because the thought looked just like me! She sat thinking, “I bet Carlyn would walk up to her and stranger to friend her!”And with that thought, she inspired herself to walk up to her and initiate a conversation. Per her story, they immediately fell into a comfortable flow and realizing they shared a lot of small world stories! Both are in the “coaching” world. Both have a passion for travel. Both are spiritual. But it wasn’t so much what the had in common but, per Sarah, how she felt: at ease. An instant connection. AND the connection boosted her confidence and self trust, knowing her intuition was spot on! Knowing Sarah’s family would be there shortly to pick her up, they began to wrap up their conversation. Thats when the story went from good to… you’ve got to be kidding me! Without thinking anything of it, Sarah casually said, “I’m so happy I came and said hi! You really do remind me of my friend, Carlyn”. Cue Marcy looking at her a little funny. Without skipping a beat, she replied, “Wait, Carlyn Shaw?”. Marcy knew Sarah lived in Colorado, I lived in Colorado and how many Carlyn’s in Colorado could there be? Think about this: Sarah thought “what would Carlyn Do?”, spots a woman who she think LOOKS LIKE ME (on the OTHER SIDE OF THE WORLD), in a small airport, builds up the courage to practice what “Carlyn Preaches”, and as a reward…. the universe hands her MY FRIEND! Imagine if she’d allowed the little bit of fear or resistance to talk her out of saying hello. What a heartbreaking thought!!! It always comes down to the moment we decide to say YES TO CONNECT that the magic happens! Second guessing due to threat is one thing but doubting due to fear of a story you make up in your mind is another. I still shake my head in disbelief: I wasn’t physically there yet my spirit kick started a stranger to friend story, in Bali. I’m beaming with pride. Best part about their connection is it reconnected me & Marcy, too! Having not spoken face to face in several years, she couldn’t wait to tell me her side of the story. So, she asked if I’d like to hop on a Zoom Chat and be interviewed for her new show, The Passion Purpose Academy. Just think, 10 years after I hired her as my “Purpose” Coach and she’s interviewing me to learn about Strangers To Friends. Talk about a Big, Small, World. Check us out below!